More of God's Word revealed. Jesus speaks to the Pharisees. The church world today has fallen so bad that the world can’t separate the Christians from the sinners. Do you know where the word Christian came from? It came from the world. In the city of Antioch they saw men living like Jesus so they called them Christians: meaning Christ like. Do you think these men were walking the streets cursing and all other kinds of sins when they called them this? God said you have to think things through Come now, let us reason together, saith the Lord (Isaiah 1:18a). If people would take time to reason with God instead of self they would understand God better. One of the things those that that believe in Unconditional Eternal Security claim is that once God is your Father, he won’t disinherit you; that is foolishness I will smite thee with pestilence, and disinherit them (Numbers 14:12). People are children of the devil in sin, but that can change. How much more so if a person is a child of God? If we say that we have not sinned, we make him a liar, and his word is not in us. (I John 1:10). Now, we are all born into sin in need of a Savior, but make note of this verse. In the English language “have” is in the past tense. John was not saying that we continue in sin. I always thought it was funny how the same people that say that all things are possible with God; that we can have faith to move mountains, do not believe God can move the mountain of sin from ones life and keep them from sinning if they only yield to the Blood of Jesus. They have made the Blood powerless. They answered and said unto him, Abraham is our father. Jesus saith unto them, If ye were Abraham’s children, ye would do the works of Abraham. But now ye seek to kill me, a man that hath told you the truth, which I have heard of God: this did not Abraham. (John 8:39, 40). Now, people say I am harsh, but Jesus told it like it was. These men were children of the devil, not God’s; and Jesus knew it. 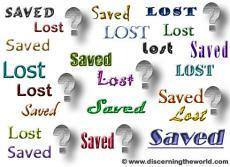 We are not saved by works, but if someone is saved it will show in their lives. Jesus went on to tell the same group Jesus said unto them, If God were your Father, ye would love me: for I proceeded forth and came from God; neither came I of myself, but he sent me. Why do ye not understand my speech? even because ye cannot hear my word (John 8: 42, 43). People of the world today haven’t changed. They can’t understand the Word because they don’t want to. Here these men had the Word made flesh standing before them and they refused to hear. When people fight the truth and those that deliver it, it isn’t them they are fighting: it is God. Jesus went on to tell him what he thought of them Ye are of you father the devil, and the lusts of your father ye will do. He was a murderer from the beginning, and abode not in the truth, because there was no truth in him. When he speaketh a lie, he speaketh of his own: for he is a liar and the father of it (John 8:44). Those not in the truth does not belong to God, but the devil. These are not my words, but those of Jesus. They acted like their father the devil, and people today are, too. Even the devil can lie through people and claim to be of God. The Bible tells us to be holy Follow peace with all men, and holiness, without which no man shall see the Lord (Hebrews 12:14). You can’t sin and be holy before God. The Pentecostals tried to make holiness an outward thing, make-up, jewelry, and such. That isn’t true holiness. The holiness of God is walking with him sin free.
. It is sad to look back and see what the Pentecostals had at one time. It was started by two Baptists men that were tired of food socials and knew there was more to God than that. Now, even they have fallen into the muck of sin. And because I tell you the truth you believe me not. Which of you convinceth me of sin? And if I say the truth, why do ye no believe me? He that is of God heareth God’s words: ye therefore hear them not, because ye are not of God (John 8:45-47). Then, with Jesus standing before them they doubted him. They could find no sin in him. Do not think people will love you for the truth? No, not all will. Many will falsely accuse you but what they say matters not. It is what you and God know that counts. Many today go into their dead, lifeless churches and put on a show. They sin all week and then act like they love the Lord on Sunday. God sees them for what they are: hypocrites. They put on an act with a dead soul, and a dead soul can’t enter Heaven The soul that sinneth, it shall die (Ezekiel 18:20a). He that committeth sin is of the devil; for the devil sinneth from the beginning. For this purpose the Son of God was manifested, that he might destroy the works of the devil (I John 3:8). He that sins and continues to sin belongs to the devil, Jesus said it. He came to destroy the works of the devil, and sin is one of those. He did not mean to destroy it when you get to Heaven, but down here. This will continue later, there is much more in the Word to explain the spiritual walk He asks of his children. © Copyright 2019 Upper Room. All rights reserved. It's time to move Now! Will You Crucify Jesus Or Suffer With Him? This page was created in 0.5813 seconds.